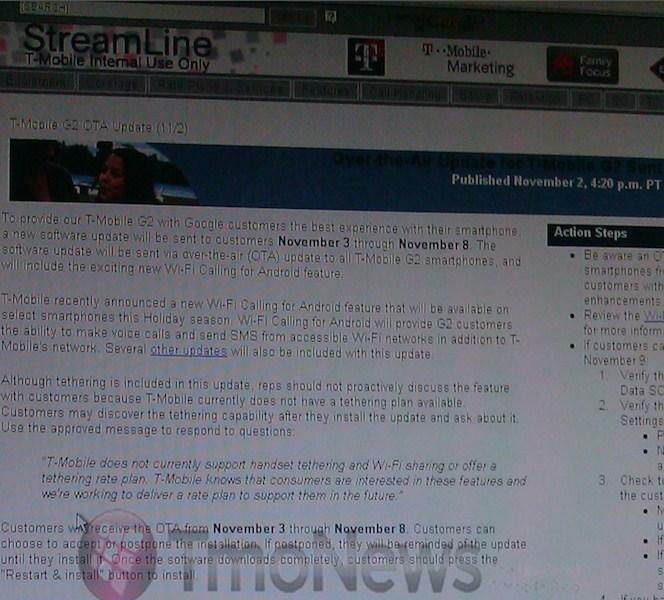 You are here: Home > T-Mobile G2 To Get Wi-Fi Calling Update Starting Tomorrow! Owners of the T-Mobile G2 have been left wondering when or if they might be graced with the goodness that is Android Wi-Fi calling. Well, wonder no more as T-Mobile will officially start sending out an OTA update starting tomorrow. November 3rd to November 8th, G2 owners will receive the Android Wi-Fi calling feature. Of course, included in the Wi-Fi calling feature is the tethering option as well. Not sure what the deal is with the little italicized line regarding not offering a tethering plan. Pretty sure they do since you know it was just announced. Hey, can’t win em all, right! Nice to see them showing the G2 some love. But time to fork over the 15 dollars a month. Well not unless you root..
Teather is so so for me. Wifi calling is cool, I’d like to see what “other updates” include. I hope they fix some of the other annoying little things..
I’m more interedsed in what the “other updates” are maybe 2.2.1? David/Andrew Do you believe that they will be also offering this on the froyo update for the Samsung Vibrant? I would think so. Still waiting patiently for the 2.2 Froyo update for my Vibrant as well. It would’ve been a huge win on Tmo’s part if they didn’t charge to tether. I want to know the stats about people who tether. I’m just going to root the phone whenever that comes along. I can’t say I tether enough to make the 15 bucks worth it. I mean they allowed me to tether my BB through USB or bluetooth for no charge. We pay for data, which they will throttle once a certain amount is reached. I think we should be able to use the data how we please. will it count against your minutes iF you use wifi calling and texting? anyone? Yes it will count against your minutes. Then what sense does it make to use wifi calling if you’re still using your minutes? Uhh… Works great in places where you have little signal and there is an active wifi network. Works great when you are overseas and you can get into a wifi network… Free calling. Timdawg919 says: Then what sense does it make to use wifi calling if you’re still using your minutes? To add coverage to areas that have limited to no coverage. Can’t you make calls and sent texts on Google Voice through wi-fi? Go read the posts at XDA. Likely this will do nothing. If you are in an area with no service and have wi-fi calling can you send text messages 2 or is it only limited to calling? It works for calling sms and mms! Using it on the my touch 4g right now. LOL, just wait until they delay it until December 15th like they did the MyTouch 3G. That’s because tethering is not going live until the 18th. Thats odd. Im using the feature now while typing this? Where do you get your info? I would move to another source. I wonder what the “other updates” that are coming along with this one are? The update I reported just under a month ago was “too good to be true” according to Tmonews. I’m curious if I will get some update or if it will just bring all units up to the version that I (and some others) got. Ok I will bite… What features did you receive with your update? Wifi Calling, Wifi HotSpot, and was able to update Goggles from the Market. The ringer when on Wifi calling is really low though, and there doesn’t seem to be a way to adjust it. This statement basically says they are rolling tethering in the update from the 3rd to the 8th & the customer may discover & use it in which they hope it is not discovered till they have a plan ready. So if they are rolling out the tethering compatibility unblocked, how do they block it hmmm? Certainly the block wont be built in. I hope the Nexus One can get this update too because I desperately need it in my house. This is great Josh, but I don’t think its right that you come to my site to plug your own. I wouldn’t do that to you so I expect the same level of respect. Ouch respect… Oh btw how do I know when I’m being responded or replied to? I don’t recieve an email? What updates? HTC and T-Mo claim there are no issues with the phone. Hmm gonna wait on this one. Don’t know about you guys but I can teither pretty well for free with just temp root. If this OTA patches that then i’d really hate myself. So by saying November 3rd-8th, does that mean almost nobody will get it until the 8th? That is what I have noticed in the past. Come and support the T-Mobile UMA facebook fan page!!! ii had to wake up to this……..
got up early this morning to take my 4 day old G-2 back to the t-mo store and swap it for a DEFY. drinking my tea with the wheels whirring. only shortfall i could find in the G-2 is the ringer isn’t loud enough. well it’s a 75 mile ride so i’ll think some more. wonder if the update will be OTA or OTA/WIFI? BTW; all you nitpickers whining about tethering, i can do it with my old samsung SGH-205 that i bought in janurary 2002 no problemo. I wonder if the apk I have on my Mytouch Slide will start working now…..hmm. Hopefully it was just a switch on TMobiles back end they needed to flip. First one to rip the app and share the wealth wins! I hope they put the tmobile visual voice mail app back out with this release. I tmo’s version to google voice. That should say I prefer tmo’s version to google voice. Just got my update! Downloading as we speak. Here is the link to the update. How do we use this link to update? Plug your G2 into your computer, and copy the update.zip to your SD card. Shut off your G2, and power back on while holding volume down. When you see the white screen, choose recovery and hit the power button. When you see the picture of the G2 with the red triangle, hold volume up and power to see your menu. From the menu, choose Apply sdcard:update.zip, and let it do it’s thing. So I tried using Bootloader for this, but wasnt able too, even after setting up as zip in my sd card. Same as what sjsmr2 said, but a bit easier to parse. Yeah, I got in on the second try. Holding down the trackpad brings up the menu too in as round bout way. Tethering and wifi calling, but the wifi calling came up with an error soon after. Just powercycled and good to go. Thanks. Thanks for the link. Downloaded and installed. Sweet! I wonder if this update fixes all of the reboot/crashing/freezing issues I had with both of the G2’s I had gotten (and returned to tmo as of yesterday)? Just got my notification of update in South Florida… I’m skeered to do it though. Anyone else try it yet? anyone got this update yet? Got it running… Tethering and Wifi confirmed. I will have to wait until I get home to confirm UMA calling. I haven’t tried them yet, but the USB Tethering and Portable Hotspot options from Froyo are indeed present! Well I got the update….couldn’t wait to receive so I went online and found it @ And…Central. I did the update as per instructions….and I was able to get WiFi calling and Tethering, both of which I will test tonight. I have not seen any other bug fixes fixed….but I have only had it for a few minutes. So question on tethering….I could *cough cough* do this prior to the update….I really don’t use it nor have much of need for it…BUT….will TMO know that I am tethering and force me into a plan automatically or block my web access? I know that I am limited to 5GB, and so far that seems to be enough for me….but will I have to pay extra for that occasional tether? So far lock screen sound, wifi calling, tether, imap mail issue, gmail attachment problem. Lock screen sound? Is this the sliding lock or the code lock? My sliding lock just has haptic feedback, no sound. I am wondering if we are going to get charged for using the tethering right now. It is in the update and it does work. Just tried here using the university network. Works fine for me. @shawn, have you done a reboot after doing the update? try to do a reboot. that should fix it. I just manually updated and it works. Am I supposed to delete the update.zip file after installing it or am I supposed to leave it on the SD card? I tried again at the my university (rather slow network). I have no experience with UMA, but as far as I can tell no delay sound quality is great. Can’t compare to UMA (never had one), but compare to regular voice is pretty much the same..
do you have to explicitly open a wifi app and dial through that or will it just make calls over wifi if you don’t have a cell signal (like my BB does)? You have to have wifi on and specifically turn on “the wifi calling” app. Thr appl takes about 10 second to start working…checking connection and contecting tmo server I think. Jimmy, thanks for your answers. but can I just leave it on all the time in the background? or do I have to switch it on every time I get on the wifi network? my main use is at home where I have zero coverage. right now when I come home my BB just hops on wifi. would be great if I could do that on Android too. I don’t need call handoff — that has really only come in handy 2-3 times a year. But having to manually start the app every time I come home would be a pain — and I would def forget to do it. @MH – Yes, you can leave it on in the background. If you have the feature enabled, you can leave it alone after that. Every time you go into your wifi zone, it will launch the app and allow everything to be UMA aka wifi calling. So it is nice that you won’t ever have to remember to do anything. It will just kick in when it connects with the wifi. I like that too! k-mack (& Jimmy) – thanks so much, that’s what I needed to know. Seems like everyone was so excited about this feature and then when the big day came it kind of disappeared under so much other TMO news. W/o this feature I just can’t move to Android — but now I can! On mytouch HD, using the Wifi calling feature lowers the ringer volume and there is no way to adjust it :-(. Using cellular data, resets the ringer volume to your preset level. omg i am the happiest person in the world! and i also got it rooted and have the tethering app for free thats a plus it still works too! OPTION#1. Using T-Mobile’s cellular network for both data and voice calls. OPTION#2. Using T-Mobile’s cellular network for voice calls and a WiFi connection for data. OPTION#3. Using a WiFi connection for both data and voice calls (which is now possible with this recent update). Can someone confirm that unlimited hot spot calling (the old $9.99/mo free minutes in wifi option) still works with the G2. I have been waiting for an Android device to replace the nokia UMA phone…this just may be it. That is a good question, I am wondering about that too. I’m thinking if you have the old grandfathered plan, it will continue to be free. If you don’t have it, it will use your existing minutes. A call to customer service will probably tell us. Thanks for posting where to download the update instead of waiting. Worked like a dream! Nice to see the system working like it should. The “extra’s” installed are an update to the radio as well as fixes to reboots and halts. I am trying to download and save the update but my phone keeps saying cannot download phone cannot support…any ideas?? i have a question when i got my g2 it came with another sim card do i have to use that card to get the update or is my old one good ? Anyone else realize they fixed the Car Home app? Not only can I customize it now, I can tell it to enable car mode when it connects via bluetooth to my car. It was annoying me the Nexus, which has a dock, (and probably others) had this and not the G2. Um, it’s the 9th and still no update. Anyone else? just got my update today….verified hotspot/tethering wirelessly FO SHO working! I did receive mine on the 9th. Still no update here, Louisville. Got the update Sunday and now my phone burns through the battery every 6 hours.